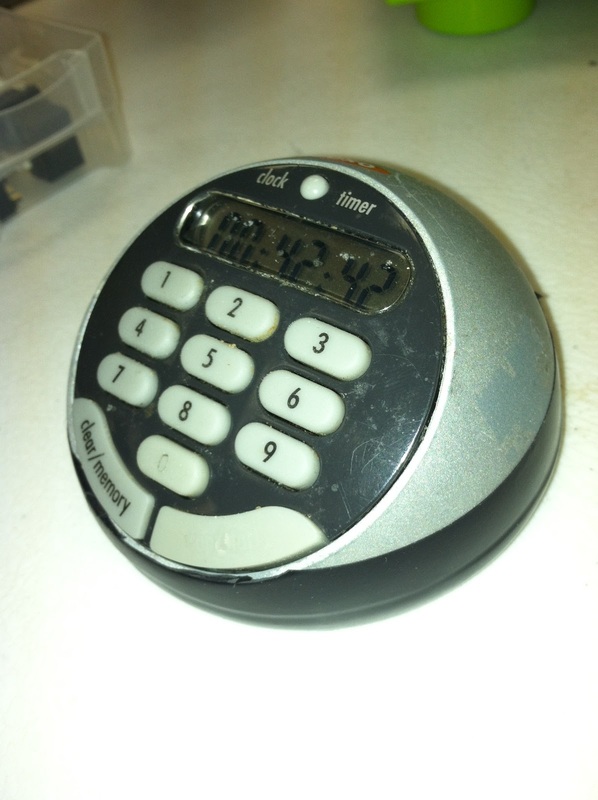 Our kitchen timer has been acting up recently, and with Thanksgiving quickly approaching, I needed to do something about it. The push button for the start/stop function has been getting harder and harder to use. In the past, I've cracked it open and cleaned out the pad underneath the rubberized button membrane, but this time, doing this didn't work. I also wanted a more permanent fix. 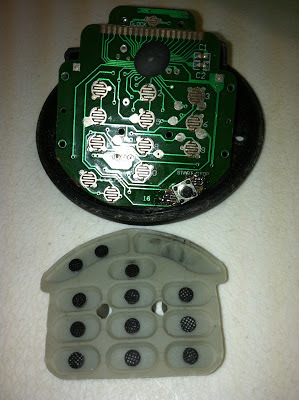 I decided to replace the membrane switch for that function with one of these tactile buttons. 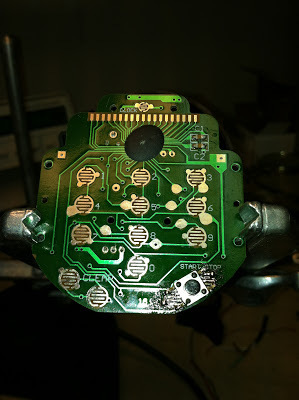 I just had to make sure that the solder pads would line up. I worked out an orientation in which the solder pads would match the pushbutton pads, as you can see in the next image. The only issue is that rather than the rubber membrane sitting flush with the board, it now had to accomodate the shape and size of the switch along with the button which extended out quite far. I used a pair of diagonal cutters to nip away at the rubber from behind to recess the switch into the button itself, Ben Heck style. You can see this in the top right of the gray membrane. The two contact pads have been removed, and instead there is the hole, into which the switch recesses. The hole was made fairly crudely, but it works! It's been accidentally abused over the years, and as a result, the screws on the bottom no longer hold it together as the plastic has broken enough. The strip of electrical tape around the base does well to hold it together while still looking super stylish! NOTE: It's not actually very stylish, but rather, functional and should last for many years more to come. No reason to throw it out, when an hour or so of work will get it fully functional again!